As a volunteer, you will get involved in many aspects of the Trust’s work by lending a hand to the staff as they carry out their daily tasks. Group conservation activities are carried out as a team effort. We have up to 10 volunteers from all around the world at the Trust at any one time, to assist us with the many areas of work we need help with. For example: aid in rescue of injured / sick animals, cleaning / feeding rehabilitating monkeys, primate census data gathering, education workshops for local area schools, tree planting, ‘colobridge’ maintenance, tree trimming, bottle feeding infant primates in our care and much more. If you would like to get a deeper understanding of environmental concerns and actions in a developing world context, come and join us. We need skills ranging from primatologists to graphic designers to carpenters! The Trust requires many different types of talents and skills from languages, education skills, journalism, and photography to business, marketing and publicity, as well as research, primatology, veterinary and other typical ‘academic’ training. This list is not inclusive of the skills we require, and our needs change regularly. Be clear on your application the skills you have that could be used to help the Trust as well as provide you with a more fulfilling volunteering experience. If you have only a short time for a volunteering holiday, join the Trust for as long as you can! There are no other specific requirements apart from the energy and the will to participate in the Trust activities! Both colobologists and eco-volunteers get involved in our primate rescue and rehabilitation cases. The level of involvement depends on experience, ability and interest. Primate rescue and rehabilitation can include anything from taking care of infants to cleaning wounds of injured monkeys to releasing healed animals. Unfortunately, we are not a sanctuary, so please be aware that we do have an euthanasia policy for individuals who cannot be released back into the wild. NOTE: There is scope for people with conservation background but also for people with private sector experience in areas such as marketing, building/maintenance, teaching, display making, web site design, graphic design, etc. People with special skills may be taken as a colobologist for shorter periods of time than the stated three months. Fly to Moi International Airport in Mombasa. Most flights to Mombasa come via Nairobi, although you may be lucky and get a direct flight. If arriving in Nairobi (at Jomo Kenyatta International Airport ), upon disembarking you will have to go through customs so pick up your luggage there, go through customs and walk to the domestic departure terminal (just across the road). 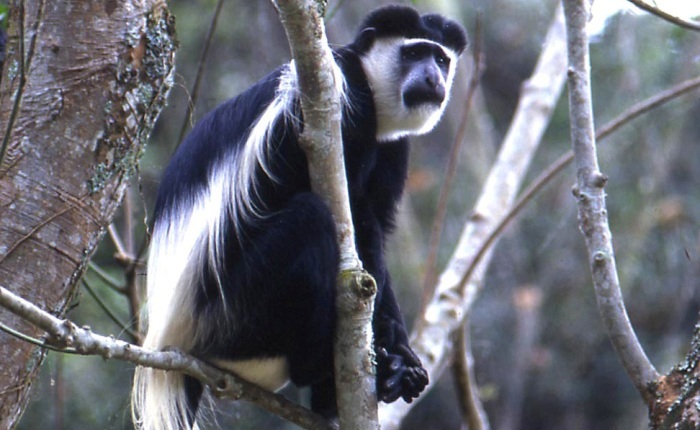 From here you will be met by our Representatives and transferred to the Colobus Trust along Shimoni. The Colobus Cottage is clean and comfortable but fairly basic. You will be sharing one room and bathroom with up to three other volunteers. We have up to ten volunteers here at any one time. Facilities include: electricity (though not always reliable especially during the rains), cooking gas, showers, fans, laundry service, cleaner/house man, drinking water delivery. The house is in a secure area and has a security service as well as a night-time guard who patrols the house grounds. Our cook prepares a simple, good quality lunch and dinner. The meals are a mix of African and European dishes and are generally vegetarian with an occasional fish and meat dish. Food for breakfast is also provided though you will need to prepare this yourself. Our cook doesn’t work on Sundays and holidays but will leave raw ingredients for you to prepare. Safari Beach Hotel is a twenty minutes walk away down the beach. There you can relax, have a drink or a pizza, take a swim in the pool or play table tennis or billiards. There are several gyms on the Diani strip that are available for volunteers to use and yoga classes are also available nearby.